5th, 11th, 18th, 23rd and 24th editions above. CD-ROM versions now available. 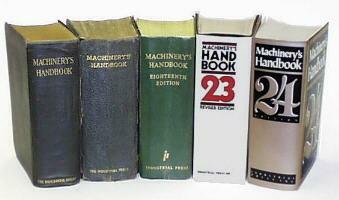 I have a long history with Machinery's Handbook. In my pre-teen years I studied my fathers 1946, 13th edition. 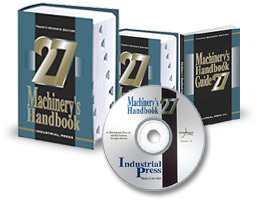 What did a 12 year old find to study in Machinery's Handbook? A little of everything. I started looking for the method used to produce marbled temper blue used on shot gun receivers (its not there). Then I read about the various industrial finishing processes (anything involving the word "acid" interests most little boys) and continued with all the articles listed under blacksmith's. I figured a blacksmith would know about the temper blue I was looking for (I was wrong), but this research led me to become a blacksmith and the anvilfire! guru. 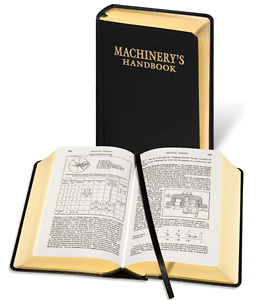 As an engineer Machinery's Handbook was one my fathers more important references and there was always one of us asking the other "where's the Machinery's Handbook?" In 1968 I was given my own copy (the 18th edition above) for Christmas. At the time I appreciated the gift but did not realize how expensive a gift it was. Ah! A NEW Edition! The first thing I looked for was temper blue! Nope! Still not there. I was amazed at how little the reference had changed and did not notice the 300 additional pages. As a machine designer rarely did a day pass that I did not refer to my Machinery's Handbook. Densities of materials, volume formulae, trigonometry, gearing application and hundreds of other subjects were used during these years. When I traveled in the field my Machinery's was always packed in my brief case and was referred to often. As a reviewer I've collected early copies of Machinery's Handbook for the comparisons in this review and exchanged correspondence with the current editors. When I got into blacksmithing I studied the sections on heat treating and standard steels. 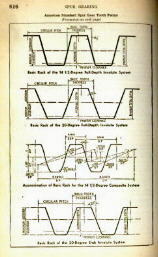 Every edition of Machinery's has had the SAE (Society of Automotive Engineers) recommended steels chart. There is also a section on standard steels, their designations and heat treatment. Over the years this section has changed remarkably. There has been a lot of new alloys and even more confusing designations in the last 90 years and Machinery's helps sort it all out. Color is not an earmark of technical references and Machinery's has been no different. 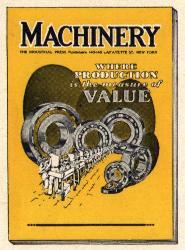 12th through 14th editions had a spoke fly wheel cartouche with black and gold embossed on the covers and a small color fronticepiece illustration of the company magazine. 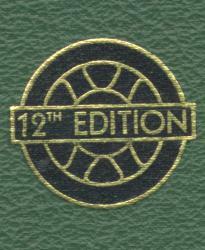 From the 17th to the 23rd editions Machinery's had colorful slip covers over the dark green leatherette binding. Starting with the 24th edition the covers are slick varnished cloth with color printing. The contents as always are 100% B&W. The Contents of Machinery's is vast. The first chapters are on mathematics and include the age old log and trig tables that have been made redundant by pocket calculators. Then there are the VERY useful trig formulas with diagrams and examples, the area and volumetric equations and the section properties formulas. All are illustrated and include examples of how they are used. As a machine designer I refer to this section often. The strength of materials section includes most of the contents of any text book on the subject plus most of the AISI structural sections (beams) dimensions and properties. Materials densities and other properties such as coefficient of friction are also included in the many charts. As a machine reference Machinery's includes information on everything from cutter bit materials and shapes, standard slides (ways), shafting ratings and critical speed formulae to name a few. There are sections on how to use a dividing head, gearing (diagram to left) and pulleys. Small tools specifications are given for drills, taps, dies, reamers, countersinks. For Blacksmiths there are many things of interest besides the steel and heat treating information. 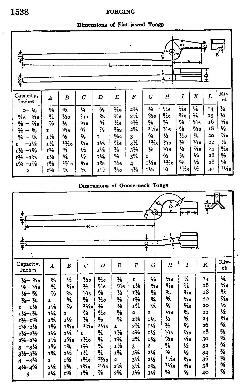 Up until the 22nd edition this standard tong dimensions chart was in the section on forging. Other blacksmith specific items included a brief article on anvils, the air needed to supply multiple forges, ratings of steam and power hammers and hammer foundations. Over the years these articles were shortened and made briefer and briefer then eventually dropped. Other items of interest to blacksmiths are sections on babbitting, welding, Thermit (better in the older editions), weights of bar, chain and fasteners. There are formulae for deflection under load. The last sections of Machinery's is drawing and standards oriented. There are charts of conversion units for weights and measures. Forge welding scarfs were the standard when the 1st edition was published and the chart above (right) introduced the welding section until at least the 15th edition. 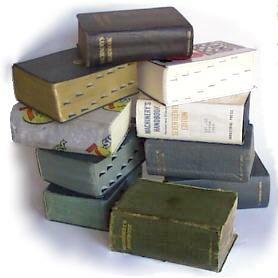 The first five editions were not available with thumb tabs but later editions were. Originally standard, the thumb tabs cost $10 US extra in the 1980's as an "option". When I ordered two copies of the 23rd edition (above right) I paid extra for the thumb tabs. I was quite disappointed when the books came and had little red tabs that measured less than 1/2" across! Perhaps they should have been called "pinkie" tabs. . . Compare them to my old 18th edition next to it with 3/4" tabs. Thumb tabs are again standard on the 25th editions up but are still the narrow 1/2" tabs. 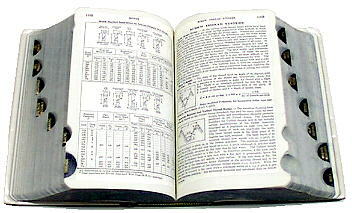 With the 28th Edition the thumb tabs shrank to short ugly semi cylindrical notches. This is a modified form of European Thumb Cut Indexing with all the cuts being the second bank type. I thought maybe the old method was no longer available. It is still available in the standard style up to the old 3/4" width from RossGage of Indianapolis. The compilation of thumb tab subjects below is based on my collection which has some gaps. Feel free to send 19th-22nd and 24th-26th tab lists. The 17th edition, 3rd printing (1964) had an unusual feature. The thumb tabs faced the center of the book. This is a VERY classy bit of bookbinding. All other editions that I've seen had them facing the front. No sooner than I'd posted a trial copy of this review I received an Email from Jim (Paw-Paw) Wilson. He said that his 17th edition, 2nd printing (1964) did not have this feature! This edition had a slip cover and did not have the flywheel cartouche or yellow spot color fronticepiece. * Errata: The new 29th edition leaves out soild state (forge) welding as do other late editions. ** Some WWII editions did not have thumbtabs. 1 Supplied by Mack Allgrave, Oct. 2014. The table above tracks changes related to blacksmithing and forging. Other changes could be similarly tracked as technology changed. For example the early editions include detail methods of old style hand belt lacing and joint gluing. Over time these were replced with patent laces and now only high performance belting with glued joints is discussed in detail. 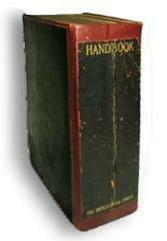 The early handbooks included a wide variety of rivet head designs many of which are no longer used and considered decorative heads. One of the largest areas of change is materials such as alloys and tool steels and the inclusion of carbides. Often verbose articles have been carefully edited down to their bare essence in order to keep them. Standards such as drawing standards and fastener standards have changed greatly over the years. There are so many standards referenced in the new 27th edition that there is a seperate standards index. All the old dated forging articles (the entire section) were removed from the 27th edition. The 27th CD-Rom version has an "extras" section (363 pages) that includes a lot of old articles that have been taken out in recent years including the long section on forging and the tongs dimensions chart. There is also the long article on Thermit welding that has been missing in recent years. Trivia -- Did you know that the small center drawer found in almost every machinist's tool chest was designed to fit Machinery's Handbook? While preparing for this review I started collecting copies of the handbook. When I started buying on ebay.com there were some real bargains. However, my buying every Handbook that was listed for a few weeks caused a buying and selling panic and prices went nuts. Since then, with the publication of this review in 1998 folks have started collecting old Machinery's Handbooks. This review has now been updated to reflect the collectors as well as users interest in the book. 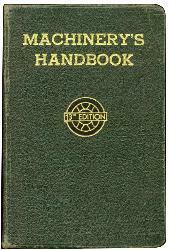 This 1914 first edition of Machinery's Handbook with patchy cover and possibly broken back sold for $500 US on ebay in spring 2006. The title page stated FIRST EDITION TENTH THOUSAND. Industrial Press says that over 30,000 copies were sold in the first two years. 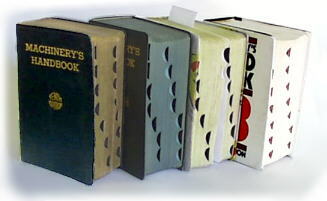 Five "editions" (see below) were printed in the first 2 years. After the 6th edition updates were made about every 4 years. Currently later editions like the 1919 5th edition shown on top of the stack above are only selling for $25 to $35 as are most older editions. Often 1950-60's editions go for as little as $15 (a fair price). However, care must be taken purchasing new and used editions of Machinerys. While updating this review I saw 26th editions selling for over double the new price and a 5th edition for $270. Often dealers reselling the book are buying it at list price of $89 and more than doubling the price for placing the order. In 1914 Industrial Press produced the first through fourth "editions" which were identical except for differences in the title page and preface. The fifth edition was the same as the first and produced in 1915. Its tenth printing was in 1919. It was the "current" edition until 1924. Comparisons of the third edition and fifth editions' table of contents and index pages shown them to be identical. So for practical purposes all "editions" prior to the 6th are just printings of the first edition with at the most a few corrected typos. SIXTH 1924 January ??? ? 1599 ? To produce this edition Industrial Press had to find and purchase an original in good enough condition to reproduce. This reproduction has a soft leatheret cover the same as the original and modern mylar gold leaf edging and stamping. Includes protective reusable box.